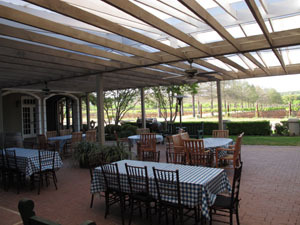 Gather your friends and head to Fall Creek Vineyards on Saturday, June 11, 2011, for wine tasting and a gourmet ”Flower Pot” lunch on the beautiful, mist-cooled courtyard terrace. Unique “Flower Pot Picnic Lunches” are available in a bright pot, planted with a summer flower to take home as a memento, as well as a souvenir Fall Creek Vineyards wine glass. Purchase an engraved Riedel wine stem for just a few dollars more. Two lunch selections are chicken salad or turkey on wheat bread, chips, pickle and a brownie. 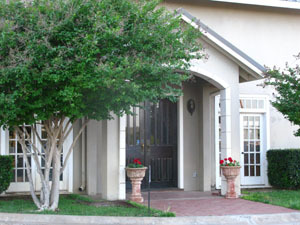 Call the vineyard during Tasting Room hours (M-F 11a-4p, Sat 11a-5p, Sun Noon-4p) at 325-379-5361 to make your reservations. Lunch, flower pot, tasting and glass for $22 per adult; children under 12, $17. Fall Creek Vineyards is centrally located on the northwest shores of Lake Buchanan at Tow, Texas, in the Hill Country and is open to the public every day. Visitors enter the spectacular winery property down an allée of cyprus trees and are greeted by an inviting courtyard ensconced by classical architecture. It's a peaceful setting, and visitors enjoy dawdling while enjoying views of ripening grapes in the vineyards. In the tasting room and gift shop with gourmet food bar, staff cordially invite guests to tour, taste and relax on the courtyard savoring the many acclaimed wines: Chardonnay, Caché, Viognier, Chenin Blanc, Sauvignon Blanc, Cabernet Sauvignon, Merlot, MERITUS, newly released Tempranillo, and others.